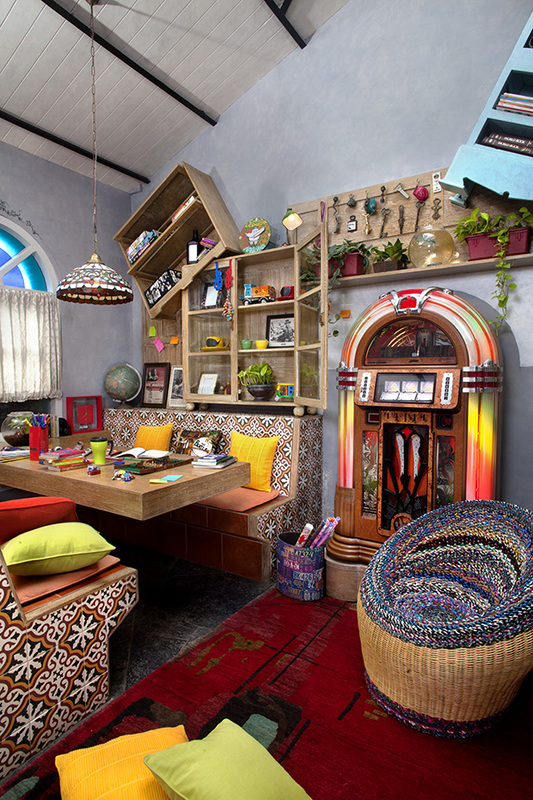 Lopsided furniture, a juke box, games and a lot more…Here’s a teenager’s corner with seating dressed in baroque-pattern tiles to capture their fancy. 3 This set of monkey hangers has been inspired by the famous nursery rhyme Five Little Monkeys Jumping on the Bed. What’s more, there’s no need to drill holes to ‘install’ this hardware; simply hook the little fellows on a door or shelf. Available in red, blue and black; ₹ 1,310; SANCTUM and TAPPU KI DUKAAN. 4 These tiny ceramic and fabric dolls revive the dying art of puppetry. They can be strung onto the key rings or displayed, like here, as sweet decoration; ₹ 120 (each); SANCTUM. 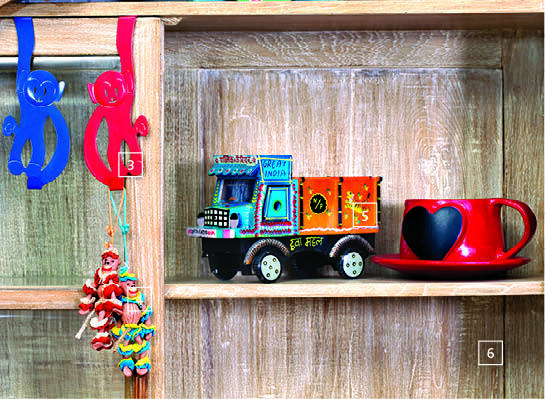 5 The iconic Indian lorry becomes a colourful artefact; ₹ 2,350; CONTEMPORARY ARTS AND CRAFTS. 6 This terracotta teacup ditches its basic function and instead takes the role of a planter. Perfect for succulents, its front sports a black patch that you can scribble a witty message or a reminder on; ₹ 625; TAPPU KI DUKAAN. 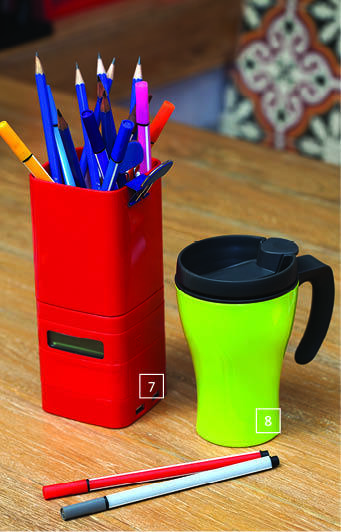 7 Lexon’s Total Totem Pen holder will stylishly eat up the clutter on your child’s desk. It has five blocks that serve as a paper-clip-holder, a clock, a tape dispenser, a 4-plug USB hub and a pen stand piled atop one another; ₹ 2,999; ROTI KAPDA MAKAAN. 8 The Thermo Mug from Rosti is good to have by your side on a chilly, rainy evening. The 250-ml container promises to maintain the temperature of your pick-me-up for upto 45 minutes. Pressing the button ‘opens’ the built-in handle. Choose between lime green, white, black and grey; ₹ 890; TRANCEFORME. 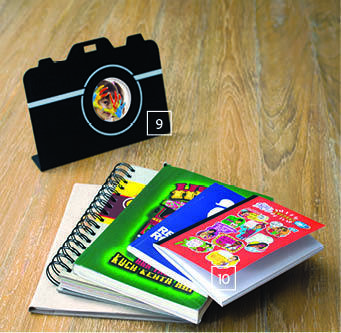 9 Capture those cherished moments in the lens of this plastic camera-shaped photo-frame; ₹ 1,200; TRANCEFORME. 10 Taking down study notes becomes less of a bore in these colourful notebooks; ₹ 75 to ₹ 550; LOOSE ENDS. 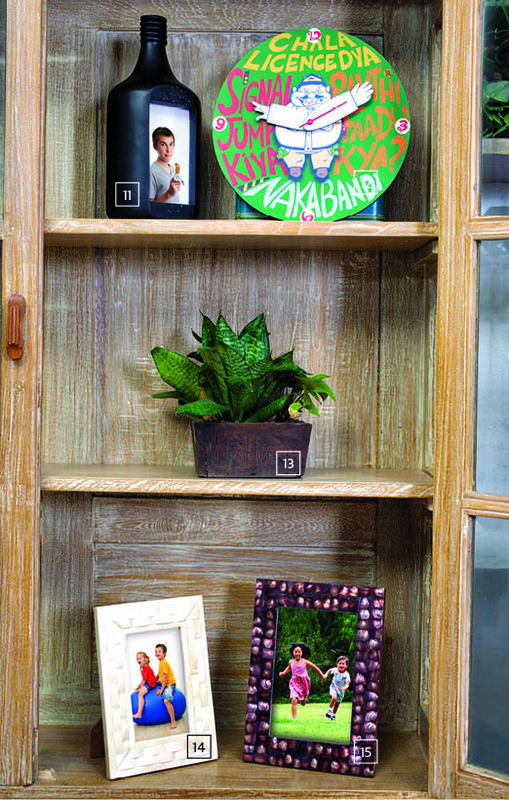 11 A photograph gives way to a message in this wooden bottle-shaped photo-frame titled Photofinish. A brainchild of Happily Unmarried; ₹ 600; TAPPU KI DUKAAN. 12 This rolypoly Chala License Dya policeman becomes a bit of a contortionist to direct time… and ensure that your child is never late for those coaching classes or football practices; ₹ 1,600; LOOSE ENDS. 13 A group of succulents snuggle together in this wooden planter. Perfect for those who love plants but don’t have the time to look after them; ₹ 550; SANCTUM. 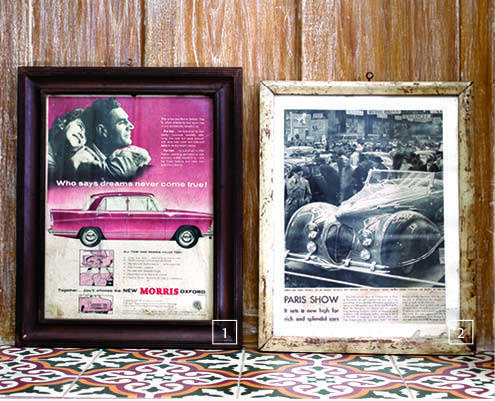 14 & 15 Photo-frames in camel bone (ivory-coloured) and mother-of-pearl (iridescent magenta) to showcase those sentimental moments; ₹ 600 (camel bone); ₹ 750 (mother of pearl); CONTEMPORARY ARTS AND CRAFTS. 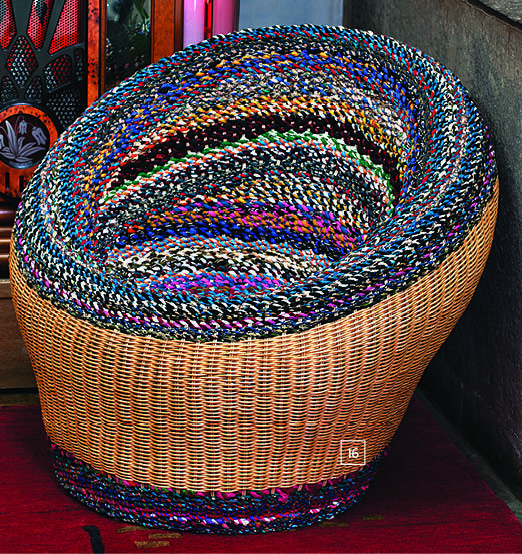 16 Get your kids started early on green with the eco-friendly Faros Chair whose body is woven from bamboo and cane and whose seat features an upholstery of recycled fabric; DHOOP. 17 Bright and playful, the red dial of the Zone Wall Clock from Salt & Pepper seems to float on the glass surface; ₹ 3,910; TRANCEFORME. 18 Watch the matte-finished resin dachshund on these bookends grow longer as your child’s library becomes bigger; ₹ 4,400; MORA TAARA. 19 A soothing jade-hued cotton cushion cover; ₹ 290; CONTEMPORARY ARTS AND CRAFTS. 20 Pin tucks lend the mango-hued cotton cushion cover texture; ₹ 420; CONTEMPORARY ARTS AND CRAFTS. 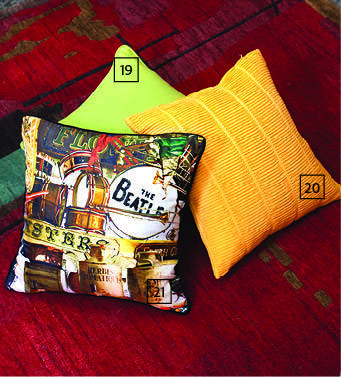 21 The digital-printed silk cushion cover has the name of the famous 60s English rock band, The Beatles, embroidered in sequins; TRANCEFORME. 22 A turtle takes a leisurely walk and a parrot perches daintily on the rims of these glazed ceramic planters; ₹ 350 (each); DHOOP. 23 A traditional hammered copper vessel makes a comeback as a planter with a patina finish; ₹ 1,290; SANCTUM. 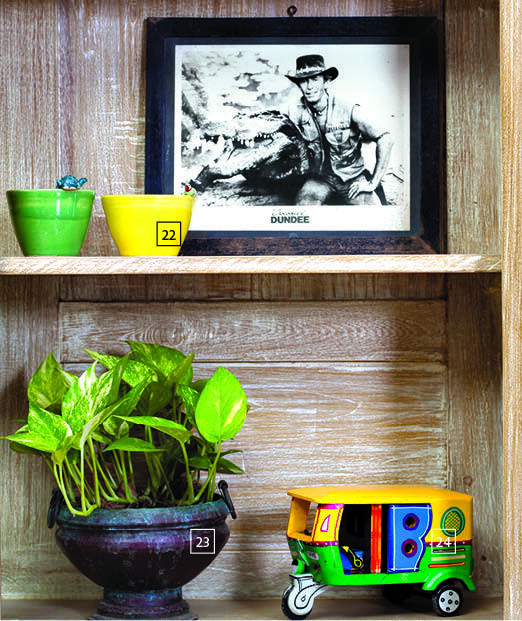 24 Parked on this shelf is a colourful wooden replica of the popular mode of public transport, an autorickshaw; ₹ 1,450; CONTEMPORARY ARTS AND CRAFTS. 25 Roll it on the floor or hang it on the wall. 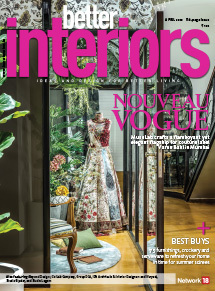 Either way, the Carpinus carpet, made of hand-knotted, hand-spun wool, will stand out as a piece of art; ₹ 45,000; COCOON FINE RUGS. 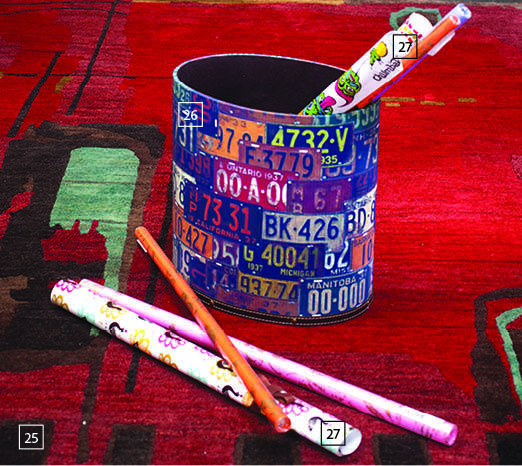 26 Number plates swirl around the surface to form pop graffiti on this wastepaper basket; ₹ 1,490; MORA TAARA. 27 Here’s an assortment of wrapping papers in various sizes and patterns; ₹ 45 to ₹ 130; CONTEMPORARY ARTS AND CRAFTS, LOOSE ENDS and TAPPU KI DUKAAN. 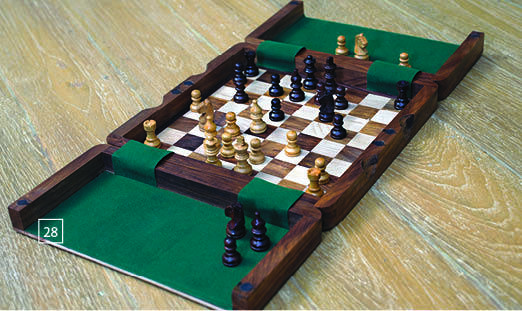 28 This chess set has pieces intricately carved from teak and the board can be folded up into a box; ₹ 1,180; CONTEMPORARY ARTS AND CRAFTS. 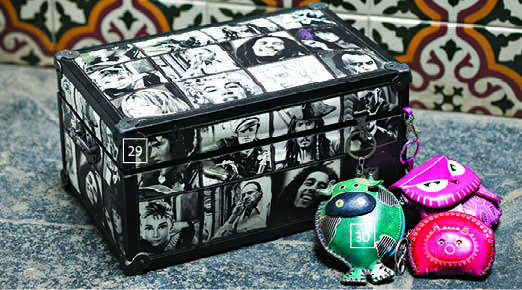 29 The plywood Hollywood Chest has famous faces digitally printed onto its composite leather-clad surface. Your budding star can store DVDs in this felt and velvet-lined box; TRANCEFORME. 30 This assortment of leather purses, shaped to resemble owls, cows and piglets stylishly accommodates petty cash or small essentials knick-knacks; ₹ 490; MORA TAARA.